Jacob first came to our attention in the winter of 2017 when he was just 7 years of age. 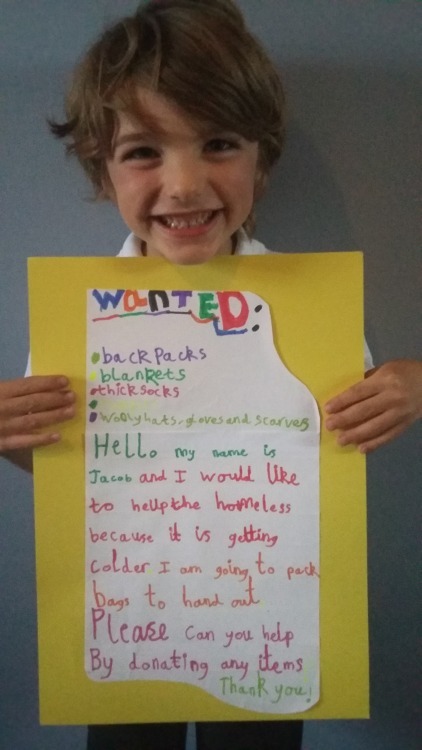 So moved by the plight of rough sleepers he took it upon himself to start his campaign “Jacob’s Backpack Campaign” to raise funds to fill backpacks to donate to rough sleepers. His original target was to be able to fill 10. Wanted: Backpacks, Blankets, Thick socks, Jumpers, Hats, gloves and scarves. Needless to say, news of the campaign quickly spread and Jacob managed to receive enough donations and raise enough money to fill 138 adult backpacks, and 60 children’s backpacks by the end of February 2018. We were instrumental in Jacob being filmed in a short BBC film which has since gone viral with over 17 million views and since then hundreds of backpacks have been donated to Jacobs Backpack Campaign. Cool to be Kind was so inspired by Jacob’s tireless work that we asked him to be our ‘Children’s Ambassador’ which he readily agreed to and since then he has worked with us to spread the words of kindness and compassion.